There is a possiblity of two more conventions, I will keep you informed. Awesome, congrats! Look forward to seeing you in Nottingham!!! Booked another convention :-)Just booked a table at another convention. I have to say I love doing this travelling all over the UK and the fact I make money is a bonus. Thank you to anybody who has swung by my stall and bought something. My Shop is now OpenDue to the success of my stalls at comic book conventions I have decided to add a shop to my website. take a look on http://www.stuartmcghee.com/shop.html as this is my first attempt at making a shop and I am not a web designer any feedback will be welcome. Even More Comic Cons :-)I have now booked a few more comic conventions for next year. Including the MCM London which I have had my eye on for a while but it was sold out until today when they released more tables. I also have a few comic conventions to do before Christmas so I hope I get it all done in the next couple of weeks. I am not used to working this fast and I hope the standard is up to my previous works. More Comic ConventionsJust finished the Dev Con 1 Sci-Fi and Comic Convention in my home town of Plymouth on Saturday and this has given me enough money to buy a table at London Super Comic Con next year. Also somebody asked me if I would do Armadacon in November and I have sent an e-mail and I am still waiting to hear. I have my eyes on some other conventions and I am waiting until they go live for bookings. MCM ScotlandI had an awesome time at the MCM Scotland in Glasgow this weekend. I sold many cards and prints, I have also had a few inquiries about commissions too. Motivation is back :DYou may of noticed I have had a sudden attack of motivation. I think it is down to having more work coming my way. I am off to Glasgow, Scotland this weekend to run a table selling cards and prints of my drawings at the MCM Scotland, just found out that they are extending the opening times due to high ticket sales which bodes well. I have another convention at the end of the month is my home town of Plymouth, Dev Con 1, this is the first convention of this size in Plymouth, so it should be interesting. 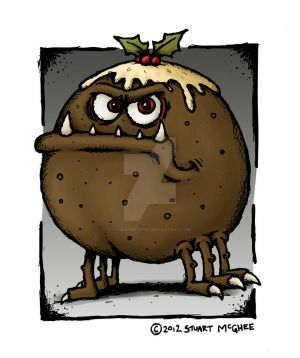 Also my publisher has asked me to illustrate a book based on my Christmas pudding monster the only problem is that he wants it for this Christmas and the author Leyland Perree has not even finished writing it yet. No motivation :-(I have recently broken up with my girlfriend and all my motivation has gone. Apart from the breakup things are going my way with my next children's book due for release in October and the many comic conventions where I will be selling cards anid prints. I should be very motivated but I am not. Dropping this, no point in really continuing it but it will stay up. Continues to make personal purchases while also taking more commissions, making personal art and other. They are obviously aware that they owe people but seem to care more about themselves then any debt. Just a warning that they've done commissions before saying they'd get it done in a time frame and didn't stay true to their word. Update 11/10/2017 @ 8:26 PM EST : Well, It's been over a month since I've heard any update as far as my refund goes. I'm still owed 7$ and it would be 17$ if one of the lovely people trying to help people affected hadn't raised points to pay me back 10$ worth. This lack of communication and action is becoming increasingly frustrating but, what can anyone do I suppose?